Fill out your Tourist Card (Visa) before you go! Some airlines are no longer handing tourist cards out on the plane like they used to, making your landing and getting through immigration slower, (this happened to us on one trip). I used the online form on my last trip and it worked perfectly. Complete the form online and PRINT IT OUT to take with you. What is a Tourist Card and why I need it? 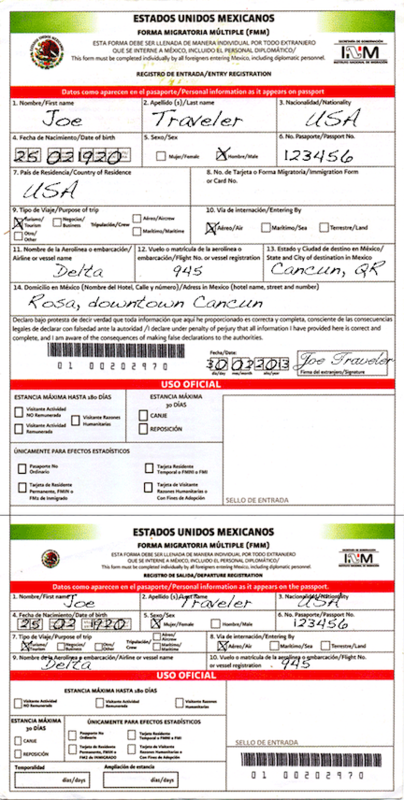 If you are visiting Mexico you need a Tourist Card which is an Entry Immigration Form that details information about your visit to Mexico. The Tourist Card is per person regardless of age and how long you will stay in Mexico. The information you provide in the Tourist Card is kept by the Mexican Immigration Authority as an official record of your visit to Mexico. How long do I have to keep my Tourist Card? There are two (2) parts of the Immigration Form, the Entry Form & the Exit Form. They will email you both forms already completed with the proper information and when you arrive in Mexico you will immediately proceed to the immigration booth at the airport where the immigration officer will keep the ENTRY Part of your form and he/she will stamp the Exit Part of the form which you will keep while in Mexico. When you are checking in for your flight back home, you will present the Exit Part of your form along with your passport. Keep this in a safe place! You must have this form, you can get a new one at the airport if you lose it, but it can cost you up to $50.00us. This form is FREE, you do not have to pay to complete the tourist card online. Then check your email for the completed form and print them out! Remember to keep the “Exit” part in safe place, you will need it when you get to the airport to go home. If you prefer not to use the online form: Your airline may or may not provide these forms, if not, you can get them at the airport after you land. 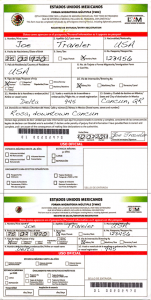 Each person traveling must fill out Mexican Tourist Card . Parents can complete the form for children. Be sure to carry a pen on the plane with you. You can go ahead and print this out to practice on if you’d like. It is pretty self-explanatory. #13 Place or city of destination, write, Cancun, Cozumel, Isla Mujeres, Riviera Maya…etc. #14 Address in Mexico, you can write in the name of your hotel. You will present this along with your passport to the immigration officer at the airport in Mexico, they will tear off the bottom section and give it back to you. Keep this in a safe place! (I always stick it inside my passport) You must turn this section in when you leave Mexico. You must have one, if you know you have lost it, go to the airport early so you don’t miss your flight home. You will have to get a new tourist card at the airport. Some people have reported having to pay up to $50us to have it replaced. So again, keep it in safe place. This is an EXAMPLE ONLY, you will need to complete an original form that you will be given on the plane or after you land in immigration at the airport.